Put another way, I could fund a small village in South Africa with the amount of money I have wasted in dog toys and dog treats over the years. Read 22 Reasons Why My Big Dogs Are Proud to Live in America for a few examples of ridiculous toys I have purchased, just because they were cute. I take full responsibility for my past prodigality, naiveté, and ignorance. With every toys’ stuffing shredded, squeaker removed or popped, dried up wasted bag of treats, I have grown wiser. This has been my journey to where I am today; picky, skeptical, and discerning about the toys and gifts I buy for my big dogs. So, all you big dog parents, put away your delusions of grandeur and the dream of keeping a stuffed dog toy stuffed for more than 10 minutes. Big Dog Mom is here to save you both time and money this holiday season as you shop for your beloved big dog. As I stated in The Ultimate Gift Guide for Big Dog Owners, this list is based entirely on products I use currently or, in a few cases, I plan on purchasing for Junior and Sulley this year for their stockings. I am not being compensated by any of these companies to promote their products nor have they had anything to do with my selection process for this list. You will see that several of these items will neither fit into a stocking, nor fall into the category of dog treats or dog toys. But my hope is that you will be able to make sense of why they are on this list when you get there. This big dog gift guide is designed to help you weed through the fancy marketing and sales pitches at the pet store and pick only those big dog gifts that will provide a return on your investment commensurate with the joy they bring to your big dog. I realize this one might seem strange to have on a big dog gift guide, but let me explain. Amazon has become a trusted search engine for product reviews, information and sourcing for more and more people every year. We signed up for Amazon Prime earlier this year and are so happy that we did. With a slew of dog related items, products for my children and a plethora of books for my husband for work, the free shipping has more than paid for our membership. In addition to unlimited FREE two-day shipping (no minimum order size), with Amazon Prime you can instantly watch thousands of movies and TV episodes as well as borrow Kindle books. If you aren’t already a member, click here for your 30-day FREE trial of Amazon Prime. I purchased two elk antlers about 5 years ago and, while they are chewed on, they have held up nicely over the years. As long as they are long enough so as to not pose a choking hazard, I believe antlers provide a safe alternative to rawhide that my dogs really like. Antlers are a fantastic source of natural Calcium, Phosphorous, Manganese and Zinc and are great for tartar control. An elk antler would be a perfect stocking stuffer for any big dog! A natural alternative to processed chews. Feel good knowing your pet is getting nature's best! While I have purchased the large red Kong in the past and have one on hand for puppies, I have found it to be too small for my Mastiffs and not quite tough enough for aggressive chewing which is why I recommend the Kong Extreme for big dogs. That said, my boys don’t generally chew their Kong when I fill it with things like frozen peanut butter, cheese, or pumpkin. The objective and purpose of the Kong is to provide stimulation for them while I’m away or when I want them to be occupied for one reason or another. I often feel like a broken record when it comes to the Kong. It is one of the dog toys that I believe all big dog owners should have. I keep a filled Kong in my freezer at all times. If you have a Kong already and are looking for some new ideas on what to stuff inside it, check out 39 Healthy Treats You Can Stuff in a Kong and Healthy Bone Broth for Dogs. Once I find something that works for me, I become a trusted and loyal advocate. The Kong brand toys, while not impervious to destruction by way of big dog jaws or paws, continue to hold their place on the Big Dog Mom Favorite Things list due to their overall strength and durability. Three toys in particular that Junior and Sulley love are the Kong Ball, Kong Wubba, Kong Jumbler Ball, and Kong Knots. Kong brand toys are reasonably priced dog toys that would make a terrific big dog gift or stocking stuffer this holiday season. These are one of Junior’s and Sulley’s favorite treats during nail cutting time. They are sourced from grass fed, free range beef and they contain no grains or by-products. They are packed with essential vitamins and minerals and each esophagus strip is naturally rich in glucosamine and chondroitin, which may reduce inflammation and improve your dog’s joint function. Read Feeding The Way Nature Intended: A Review of Raw Paws Pet Food for more in depth information about these wholesome jerky treats and to see Junior’s and Sulley’s humorous reaction to eating them for the first time. BarkBox is a subscription service for dog “parents” who truly love to spoil their canine companions. Customers who sign up can choose from different plans that deliver hand-selected dog toys, treats, and other products right to their homes. In addition, a percentage of their proceeds is donated to local animal shelters which is great. I received one of each type of BarkBox to review so stay tuned to Big Dog Mom for that in the coming weeks. For now, I will just say that I am extremely impressed with the quality and variety of toys and treats we received in each BarkBox. That said, the Super Chewer box toys were much more in line with toys I would buy for Junior and Sulley. BarkBox is so confident that their toys will stand up to even the most aggressive chewers that if your dog defeats one of their toys, they will replace it for FREE. The treats inside are all-natural, made in the USA, and without preservatives and fillers like corn, wheat and soy. And lastly, while Junior and Sulley were quite impressed with this box and everything in it, BarkBox states that if your dog doesn’t totally love an item in their BarkBox, they will send them a replacement for FREE! No muss, no fuss, no disappointed pups. I discovered K9 Salute earlier this year and decided to order some of their treats for Junior and Sulley. I had been very unhappy with all of the treats I had been buying and was looking for a crunchy cookie type treat to give the dogs while I cut their nails. Read The Ultimate Guide To Cutting Dog Nails And Having Them Love You For It and Feeding The Way Nature Intended: A Review of Raw Paws Pet Food for mentions on how much we love these treats. K9 Salute are all-natural dog treats with ingredients sourced from local American farms. This is a veteran-owned company and a portion of every sale goes to organizations which support police and military K9’s who protect and serve our great nation. What’s not to love about that?! You can order K9 Salute Treats of Honor here and in the coming weeks through Amazon as well. If you include the code GRATEFUL when you check out, you will receive 20% off during Veterans Day Weekend. After that time, use the code LOYALK9 for 10% off your first order. Like the Cooling Mat I mentioned in The Ultimate Gift Guide for Big Dog Owners, I am planning on purchasing a couple of these dog toys for Junior’s and Sulley’s stockings this year and I can’t wait to try them out! The ZogoFlex dog toys are BPA-free and non-toxic, dishwasher safe, guaranteed to last and, bonus, made in the USA! And if that’s not cool enough, they can be recycled using West Paw’s Join The Loop program. Once Junior and Sulley “open” their big dog gifts on Christmas and have a chance to play with these, I will be sure to share our experience right here on Big Dog Mom. Stay tuned. As I was searching for training treats that would be complementary to a raw dog food diet, I came across ZiwiPeak. ZiwiPeak is a complete and balanced air-dried dog food made in New Zealand with limited ingredient formulas that include 98% fresh free range, grass fed meat, organs, bones and green mussels. Their foods are free of antibiotics, growth promotants and added hormones and never include grains, corn, soy, potatoes, wheat, rice, fillers, sugars, glycerins, rendered meals, or preservatives. What initially drew me to ZiwiPeak was the size and shape of the food; small, approximately 1cm x 1cm, square pieces that I felt would be perfect for clicker training. I was absolutely right! The dogs LOVE the taste and they could not be easier to scoop into my training pouch and begin training. No mess. No waste. Love ZiwiPeak! I was introduced to California-based Real Pet Food earlier this year when I transitioned Junior and Sulley back to a raw food diet. I started ordering a monthly box of dog chews and I could not be more impressed with them. Real Pet Food offers a monthly box of tasty, air-dried, and unprocessed treats and/or chews that is sure to impress your big dog like it has Junior and Sulley. What I love most about Real Pet Food is that they don’t curate from other companies. From farm to table, they research and handpick the most nutritious combination of ingredients for their treats and chews. They never add sugars, salt, preservatives, artificial flavors or colors and they air-dry their chews to ensure the maximum nutritional benefits are delivered to your big dog. Real Pets has also started to offer Super Chews; larger, tougher chews specifically for big dogs. Junior and Sulley are particularly fond of these! There are no fees or commitments and you are able to cancel your subscription at any time with Real Pets. And if you tell them Stephanie at Big Dog Mom referred you, you will get a FREE bag of treats with your first order. 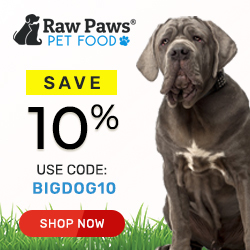 Trust me, whether raw fed or not, your big dog will love Real Pet Food treats and chews! As of today, there are 45 days until Christmas. If your dog is anything like mine, he will be happy with whatever you choose to get him. Dogs are like babies, empty boxes are all it takes to put a smile on their face. That said, I am hopeful this list of my favorite things will help you think “out of the box” this holiday season and get your big dog something special. Something commensurate with the unconditional love he gives you every day. Please use this list as you shop and consider sharing it with your big dog friends using the share buttons below. Drop me a note in the comments below and let me know what you think of this list. What are you planning on getting your big dog this holiday season? As I said in The Ultimate Gift Guide for Big Dog Owners I will be putting together a gift guide each year around this time and will be looking for more great products that will serve large and giant breed dogs and the people who love them. Please connect with me on Facebook, Twitter, or Instagram, or send me an email at stephanie@bigdogmom.com with your feedback and suggestions. Mr. N has a large dog friend who loves his Kong Jumbler. Mr. N’s favorite is the Kong Wobbler but I don’t know if they come giant-sized! Oooh, we have never played with the Kong Wobbler. My guess is, knowing the Kong company, it does come in larger sizes. I will have to check it out. Ruby says she would like to try some of these products even though she is not big! She’s actually tried Barkworthies’ elk antlers – they have a small version – and loves it. That’s wonderful! I haven’t heard of Barkworthies. I will have to check those out. Thank you! Let’s not forget that the best gift one can give their dog is the gift of time. 100% agree, Jana! Thank you for the sound wisdom. I look forward to reading about your celebrations over the holidays. You may be right about the “phew” though. Christmastime gets busier and busier every year and I feel like we often miss the point of the holiday. What a great list of toys for big dogs. Just in time for the holidays. I’ll have to share with my dog loving friends. Thank you so much for sharing this, Kamira, and for your kind words! I can imagine that big dogs need gifts that will stand up to their size. What a great list! You are absolutely right. It’s not always easy to find them, so I’m hopeful this guide helps big dog owners this holiday season. Some of these items are new to me, I’ll have to see if they have them in small dog sizes. My dogs don’t share some things well, so we have to be careful what we give them. This is the perfect list for that “dog who has everything” in your life! What a great list of items! Any dog would be happy to get anything from this list! This guide will be very helpful for big dog owners who are always looking for something for their dog to chew on that will last more than 3 seconds…lol. The puzzle toys keep Gusto entertained too and he is just a little fellow compared to your dogs. So many great treats! It does seem like a big dog could be a hard one to find gifts for. They want things that don’t fit in a stocking (not that they would leave it there long anyway). There aren’t a lot of things marketed towards big dogs. I agree, Robin. Thank you so much! I can’t believe you have an elk antler that’s lasted that long! I haven’t tried these yet, but my Husky is an extreme chewer and I think it might be a good thing for her. Her favorite toy now is actually Kong tennis balls! They last longer than most, but we have gone through a lot of them. Thanks for these great reco’s! Haha! Yep! I have two elk antlers that are still going strong. They love them! I would definitely consider one for Icy. I have heard of some dogs actually consuming them overtime, but Sulley and Junior (who can also be extreme chewers) have not set out to consume ours. Oh, and Junior and Sulley LOVE their Kong tennis balls too!!! They are awesome and virtually indestructible (virtually… ;)). Wow! Would love to see a video of stockings being unstuffed on Christmas morning. Those are some fabulous ideas for big dogs. I’ve learned what type of products I need to get for the girls. I have baskets full of unused cat toys that they have no interest in and I’ve also learned which cat treats are best for them. This is a great list for people who have big dogs. I didn’t realize the need to purchase toys that are different for large dogs. This is a perfect big dog gift list! As a big dog myself we have most of these things in my house already and I love that the toys you listed are “tough” toys! Thank you so much, Spencer! Thank you for the shout out Big Dog Mom! Great post! !